Friday was a very busy day. For what was a 'vacation day' we set off bright and early - and I mean bright since the sun was shining and reflecting off all that white snow - and braved the end of morning rush hour(s) to go down to the City-County Building. It took us longer to find somewhat reasonably priced parking than to drive there! The purpose of our trip: to apply for our marriage license. That only took about 10 minutes and before we knew it we were at stop #2: my post-surgery check up. We were about a half hour early so we used the time to read. Naturally, despite being early, we were there until nearly 2 pm. Next up was the fun part of the day: lunch at Casbah! I've been wanting to have lunch at Casbah ever since we went there for my birthday and I fell in love with the salad SP ordered. Not only is that salad still on the menu, but it's on the lunch menu, and there is a terrific lunch deal (more on that in a bit). We opted to sit in the covered patio area and ordered iced teas. We were served some very tasty white bread with a crunchy crust and a largish pat of unsalted butter sprinkled with coarse salt: It was pretty easy for us to decide to order Casbah's Piccola Gusto Menu: A two-course lunch starting with your choice of a salad or cup of soup followed by your choice of pasta or risotto and half sandwich. 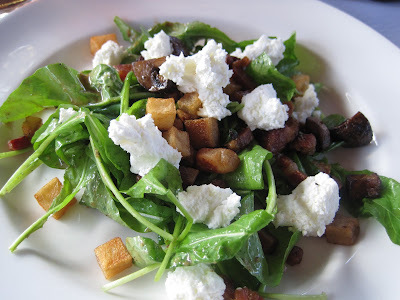 Of course I opted to start with the Arugula Salad: arugula with crimini mushrooms, pancetta, potatoes, pancetta vinaigrette, and River View Farms goat cheese. It was just as good as I remembered! When I finished the salad, I used a piece of bread to mop up all the dressing and smeared cheese! 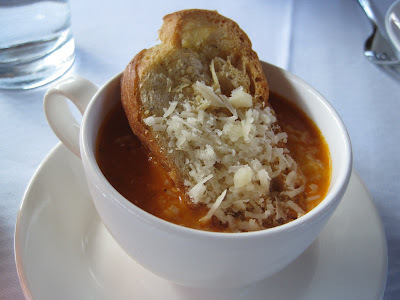 SP started with the Tomato and Basil Bisque served with parmesan crostini. The soup was delicious! 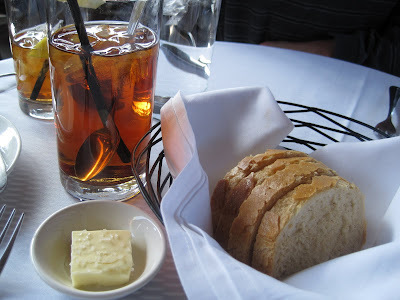 He, too, used bread to mop up every last bit of tasty soup. 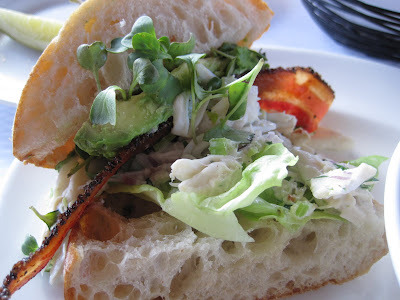 For my half sandwich I chose the Jumbo Lump Crab with pepper bacon, avocado, and radish sprouts served on a paesano bun. There was a lot of delicious crab mixed with very, very, very finely chopped celery & onion, a huge slice of pepper bacon, lots of sprouts, and a nice slice of avocado. Very good. 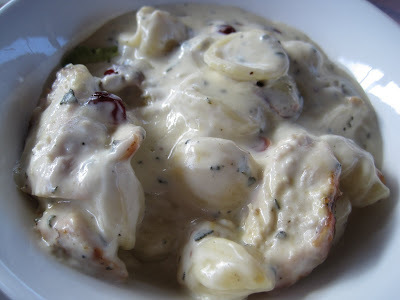 My pasta choice was the Orecchiette Pasta with grilled chicken, dried cranberries,River View Farms goat cheese, and sage cream. The pasta and sauce were delicious! You could really taste the sage and the cranberries added a nice touch to the other ingredients. SP liked my pasta a lot, too - he finished it and later said he liked it a bit more than his pasta choice! This dish is offered as an entree at dinner but I don't think I would order it as an entree - the cream sauce is so rich and filling. I think the lunch portion is just right - a larger size and I think I would quickly tire of the creamy richness. 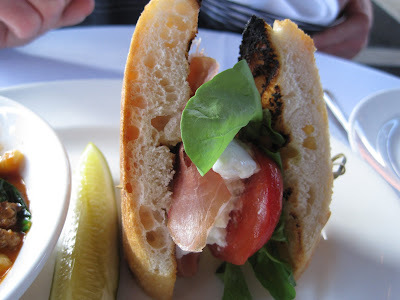 SP chose the Prosciutto Sandwich with roasted tomato, basil pesto, arugula, and buffalo mozzarella on baguette. He said it was very tasty. I considered ordering this sandwich, but decided not to because of the pesto (garlic) but he said that there wasn't a lot of pesto - just enough to add a bit of basil pesto flavor, not overwhelming at all. I tasted a bit of his prosciutto - it was sliced so thin you could almost see through it! 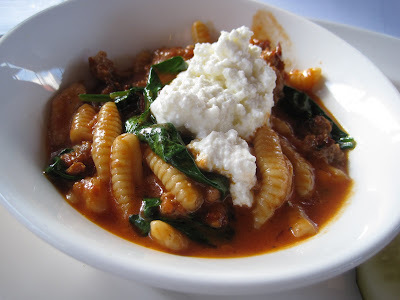 SP's pasta choice was Ricotta Cavatelli with house-made fennel sausage, spinach, crushed tomatoes, and ricotta. We both thought this was very tasty, but I couldn't eat a bowl of it because it was too peppery-spicy for me. SP really liked the peppery-spiciness. The ricotta was incredibly yummy - smooth and creamy and luscious. We passed on dessert because we were stuffed and because we had a meeting with the organist at the church to pick out wedding music. Side note: leaving Shadyside at 3:15 pm on a Friday means it will take 75 minutes to get to Carnegie. Sheesh! I would definitely go back to Casbah for lunch again - I thought the lunch deal we chose was a great deal - all that food plus bread for $13 each. Mmm! I love Casbah! What a good deal! Yay! I love when you post about Piitsburgh restaurants! Gives me good ideas! We have to pick out wedding music soon too...We're having a violinist and possibly accompanying guitar. Do you know what songs you're doing? That tomato bisque with crostini looks AMAZING!